Creating opportunities for bright futures in the trades. As the demand for qualified electricians, HVAC technicians and plumbers grows, finding people with the technical skills necessary to work in these trades is becoming a real challenge for business owners. However, if you can find quality people with a strong work ethic, training new employees for a career in the trades creates opportunity for them and helps build a strong foundation for the future of our industry. Our online courses are self-paced and engaging. NexTech Academy is changing the way our industry approaches technical training. With our flexible online courses you can begin training new employees anytime, anywhere. No previous technical training is required, just curiosity and a willingness to work hard. The curriculum for each program is specific to the trade and is broken out into several modules, which trainees can work through at their own pace. We use a number of educational tools, including reading assignments, videos, interactive exercises, quizzes and hands-on skills assessments, to deliver content and prepare students for their new trade. Additional soft skills training ensures new technicians are confident and ready to interact with clients in the field. Learn more about the NexTech Academy curriculum. 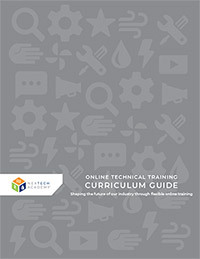 Submit your email below to download a copy of the NexTech Academy Curriculum Guide. This guide outlines our holistic learning approach and provides a detailed list of course curriculum for the HVAC and plumbing programs. Common questions about our programs. Q: Who is the ideal candidate for NexTech Academy? A: We are pleased to provide a resource for testing mechanical aptitude, the Bennett Mechanical Comprehension Test. This test can help identify candidates with good mechanical reasoning abilities and if someone may be a good fit for a technician position within your company. If you’re interested in the Bennett Mechanical Comprehension Test and you are a Nexstar member, you can order it through our Strategic Partner, Data Solutions International. Q: Is the NexTech Academy program approved in my state? A: NexTech Academy is not a state-licensed program and does not offer state certifications. It is being developed and built as a skills-training program. Throughout the program, licensing and certification information may be covered, however, NexTech Academy will not facilitate technicians obtaining licensing. Q: What code does it orientate around? The program follows both the International Code Council (ICC) and International Association of Plumbing and Mechanical Officials (IAPMO) model codes. While NexTech Academy does not directly “teach” code, it recommends that students be aware of their local and state codes, and their requirements, which may differ. A: The length of the program will largely depend on the amount of time that a student can devote to the program during their work week. Additionally, students will be able to learn at their own pace and therefore, some learners will move more quickly through the curriculum than others. NexTech Academy is not a “fast track to a truck” program. Most apprenticeship programs work on a 4- to 5-year model. NexTech Academy is being designed to take a fraction of that time. We estimate that completion of the program will take, on average, 18-24 months. As the training is progressive, students will be able to run calls at some point prior to the completion of the program. Learn to work with customers. All NexTech Academy students are required to attend additional soft skills training through Nexstar Network to prepare them for working with customers in the field. This includes two three-day courses in the classroom. Service System training is designed to help technicians gain the ability to understand how customers make buying decisions and teach them to demonstrate premium value that customers are willing to pay for. They will also learn how to identify, raise and clear objections proactively. Advanced Service System training provides additional background to help students develop refined communication skills and awareness. Skills practice will enable students to create conversations that get to the matter at hand when working with customers to make buying decisions. Resources to help further your new career. The Nexstar Legacy Foundation works to attract talented individuals to the plumbing, heating, air conditioning and electrical industries. We can help you implement strategies to recruit and retain top talent, including an exclusive job board, marketing advice and one-on-one advice. Our exclusive job board, Nexstar Network Jobs, is available to Nexstar Network members to help recruit top talent for technician positions in the trades. Nexstar Network provides a wealth of leadership training opportunities for those interested in learning more about management, planning, marketing and more. Create opportunities for professional success.